WE tv has renewed its Growing Up Hip Hop TV series for a second season. 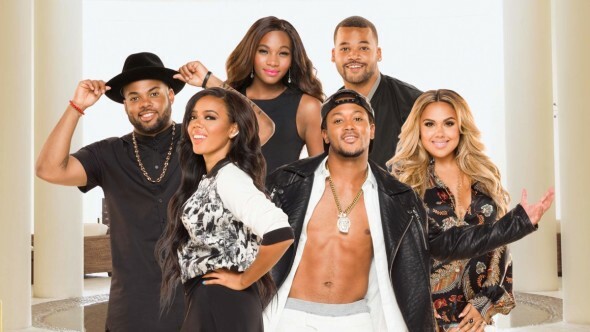 The reality show features a new generation of Hip Hop notables, including: Angela Simmons, Romeo Miller, Damon Dash (aka “Boogie”), Kristinia DeBarge, TJ Mizell, and Egypt Criss. WE announced today we’ve renewed the standout docu-series Growing Up Hip Hop for a second season, premiering in 2017. The show, featuring a new generation of hip hop moguls blazing new paths from the shadows of their famous parents, includes Angela Simmons, Romeo Miller, Damon “Boogie” Dash, Kristinia DeBarge, TJ Mizell and Egypt Criss. Angela Simmons (@AngelaSimmons), daughter of rap pioneer Rev. Run of Run- D.M.C, is a hip hop socialite, model and fashion designer of her own fashion line, Foofi & Bella, named after her toy poodle. Angela is finding her independence and determined to make a name for herself in the industry on her own. Love has also been a struggle for Angela but a long-standing friendship with Romeo Miller could turn into something more. Romeo Miller (@RomeoMiller) is a musician and Hollywood actor juggling his busy career with a fast-paced globetrotting lifestyle. The son of hip hop artist and entrepreneur Master P, Romeo Miller has known fame since he was a child star formerly known as Lil’ Romeo. Ever since he was a little boy, his father has been grooming him to take over the No Limit Empire. When given the keys to the coveted No Limit kingdom, will he have what it takes to wear the crown? Damon “Boogie” Dash (@DashDamon) is the namesake of his father, former Roc-A-Fella Records music and media mogul, Damon Dash, and just like his dad, Boogie is an entrepreneur. In 2011, he and high school pal founded Chipz Cookies, which are currently sold in grocery stores throughout Manhattan. Boogie also owns a record label and an art gallery in NYC. His father is constantly putting pressure on him to succeed on his own and pushes him to work hard for everything. Kristinia DeBarge (@kristinia) is the daughter of James DeBarge from the legendary yet troubled group DeBarge, and a singer/songwriter in her own right. She began singing when she was 3-years old and at 12-years old recorded the duet “How I Feel Inside” with her father. Questioning whether to reunite with her drug addicted father, Kristinia, leans on her uncle, music legend El DeBarge as she struggles to choose between family and fame. TJ Mizell (@TJMIZELL) is the son of Jam Master Jay, one-third of the famous rap group Run-D.M.C. He recently returned to New York stepping into his famous father’s shoes as a DJ. TJ spins at the hottest events and venues around the world and best known as A$AP Ferg’s DJ. TJ is the “nice guy” and often looks to close friend Angela for support as their fathers were both in Run-D.M.C. and view each other as family. TJ, however, is still haunted by the memories of his father’s death and determined to keep his legacy alive in a city that revered him. Egypt Criss (@EgyptCriss), the daughter of Sandra “Pepa” Denton from Salt-N-Pepa and rap icon Treach from Naughty By Nature, is actively pursuing a solo music career. Pepa is eager to help Egypt navigate the industry quickly assuming the position as “mom-ager.” Between Pepa’s protective nature and heavy involvement in Egypt’s budding career, will it prove to be too much for the aspiring singer? Check back here for more news and updates about the second season of Growing Up Hip Hop. What do you think? Are you a fan of WE tv’s Growing Up Hip Hop TV show? Do you plan to tune in for the second season?